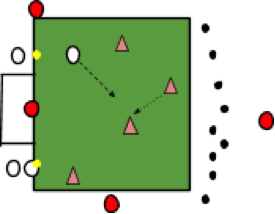 The Penalty Box Game: A fluid, competitive game with lots of shots taken under pressure! If you don’t have a marked area, make it yourself (18 x 44) (W x L). Put a cone on each side of the goal line (about 5-6 yards off of each post). Divide players into 2 or 3 teams (if you have more than 8 players it is usually better to go with 3 teams). 12 players is ideal. Assuming 3 teams, 1 team defends (they will start behind the two goal line cones), 1 team will retrieve and replace balls, and the other team will be shooting. All of the balls need to put outside of the 18 yard box about a yard or 2 off of the line. The rules are simple: All attackers must start inside the box. Only 1 attacker may leave to get a ball. As soon as (s)he touches the ball, 1 defender may enter the box to try stop the attacking team from scoring. Only 1 ball and 1 defender are allowed in the box at a time. Allow a couple of minutes for players to figure out the rules and rhythms of the game, then give each attacking team 75 second to score as many goals as possible. Rotate attacking team to defense, defense to ball retrieval, and ball retrieval to attacking. Repeat as necessary. On defense, how do you stop the other team from getting easy shots? (hustle out to the ball/show away from the goal). On offense, how do you give yourself the best chance of scoring? (hustle to get the ball, take a quick touch to goal and shoot!). On offense, how do we make it harder for the defender to stop us? (spread out – show me what that looks like). Mandate that the ball must be passed into the box before someone can shoot. Mandate that once the shooter has taken a shot, he or she must run around the nearest cone (that the defenders are lined up behind). This keeps everybody moving and allows different people to take turns shooting. It also trains the shooter to take his/her first step forward after shooting (good for rebounds). Mandate that all shots must be “first time” – means they will have to set up the ball more carefully or do more crosses. Allow 2 defenders in at a time. Add counterattack gates for the defenders to score through (at the top and corner of each end of the box). James, we played this game for the second time at last yesterday’s practice. It was a huge success. We added more of the progressions (I started the game with the progressions that we had added the last time we played). I changed the ‘first time’ progression to ‘only two touches’. Each attacker was only allowed two touches, meaning the second would have to be a pass or a shot. It changed the tempo of the game immediately. I saw the girls starting to think ahead for the first time. Some would take the second touch to pass, some would use the first to push forward and the second to shoot. I saw a lot of first time passing and shooting as a result! A wonderful session that saw us progress to our scrimmage where a lot of the ideas were actually put into practice. an excellent activity that we will definitely be using again. Music to my ears, Paul! Congratulations. Once players understand the rules to this game, you can literally play it for a portion of practice every day and it will never get old because you can always tweak it. Have you added counter attack gates off to the side for the defenders? This works well because now when they win, they will start thinking of a target instead of just clearing their lines. Keep me updated!